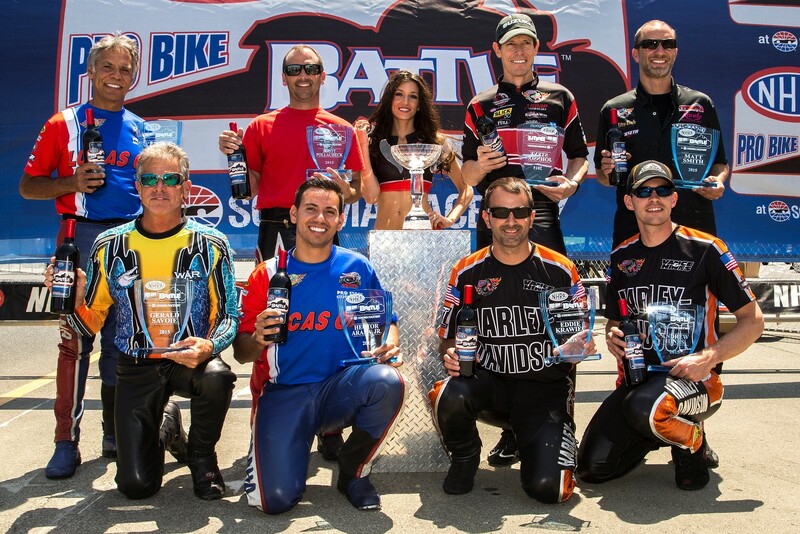 Highlights were few for the S&S-powered bikes at the NHRA Sonoma Nationals as Harley-Davidson rider Eddie Krawiec took the win from the pole position and won the annual Pro Bike Battle all-star event. Hector Arana Jr. was able to maintain his second spot in the Mello Yello championship points on his Lucas Oil Buell despite going out in the second round with a redlight. Arana Jr. also held the top speed of the meet at 198.79 mph. The top S&S-powered qualifier was Chip Ellis on Junior Pippins’s PiranaZ Buell. Ellis qualified in the fourth position at 6.853 seconds but a broken throttle cable took him out in round one of eliminations. One bright spot was second-generation rider Melissa Serber from nearby Del Rio, CA. The 21-year old racer was appearing in only her second NHRA National event on her family’s Kosman-sponsored Buell with power and tuning advice coming from the Junior Pippin camp. With a career best pass of 7.439 coming into the event, she ran a pair of 7.0 second runs on Friday but was unqualified going into the final session. Cool under pressure, Serber hit a 6.975 at 189.31 mph to make the field in the 15th position at her home track. She lost in round one against defending series champ Andrew Hines. By the semifinals of eliminations number 13 qualifier Scotty Pollacheck was the last S&S bike standing. The Petrohead Apparel Buell got taken out by #1 qualifier Krawiec who then beat the Suzuki of Jerry Savoie to get his second win of the season. Sonoma also holds the annual Pro Bike Battle, a special event for the top eight riders based on qualifying points for the previous 12 months of racing. There were four S&S-powered bikes in the elite, eight-bike field but only Hector Arana Jr. made it out of the first round. The final saw Eddie Krawiec face off with Harley-Davidson teammate Andrew Hines with Krawiec taking the win when Hines hit a redlight foul. This year’s Pro Bike Battle was marred when the event sponsor pulled out, forcing NHRA to cut the event purse. The riders contemplated boycotting the event but came to the decision to run the event “for the fans”.